E-Mail and Mailing List Privacy -- American Side Road Cycles respects your privacy. We'll use your e-mail address only when we are confirming your Internet order, when we answer your questions or notifying you of changes and updates to the site or other news. We assure you, we do not make our email list or mailing list available to anyone for any reason. A) By entering this web site ("Site") you acknowledge and agree to all terms and conditions stated herein and that you use this site at your own risk. American Side Road Cycles is not liable for any damages of any kind, including, but not limited to any special damages, incidental, indirect, or consequential damages, losses, costs or expenses of any kind which may arise through the access to or use of this Site or through your downloading of any materials on this Site. B) No obligation of any kind is assumed or implied against American Side Road Cycles by the receipt of any communication or material, including but not limited to any ideas, technology, designs, concepts, know-how, business plans or opportunities or other information ("Material"), transmitted from you to this Site. By entering this Site you acknowledge and agree that any Material you transmit to this Site is deemed non-confidential and non-proprietary, and American Side Road Cycles shall be free to use such Material without limitation, for any purpose whatsoever. By entering this Site you acknowledge and agree that nothing contained on this Site shall be construed as granting any rights, by license or otherwise, to any of American Side Road Cycles' intellectual property rights, including but not limited to copyrights, patents and trademarks. C) Material contained in this Site pertains to products and services for the United States Market only. By entering this Site you acknowledge and agree that this Site will only be construed and evaluated according to United States law. This Site may be accessed by users outside of the United States and may contain references to American Side Road Cycles products and services that are not available or are prohibited in your country. Users of this Site located outside of the United States are responsible for compliance with any and all applicable local laws. American Side Road Cycles makes no representations that the materials contained within this Site are appropriate for locations outside of the United States.All products in this online catalog are intended and sold for aftermarket use only. Our part numbers and corresponding text are not intended to imply that any of these parts are Harley-Davidson&REG; original equipment. D) All parts listed in this web site are from independent aftermarket sources. Even though these products have brand names inserted, they are intended for brand identification only. They are aftermarket products and are not necessarily endorsed or recommended by any motorcycle manufacturer. None of the parts illustrated were manufactured by the original equipment manufacturer or under their supervision or control. All other brand names or trademarks or registered trademarks used in this online catalog are the property of their respective holders. E) Except as provided for herein, no portion of this Site may be used in any manner, or for any purpose, without the prior written permission of American Side Road Cycles.You may view, copy and print the material contained on this Site for your personal, noncommercial purposes only, provided you do not delete any proprietary notices or modify any material contained on this Site in any way. Modification or use of the material in this Site for any other purposes is a violation of American Side Road Cycles' legal rights, and may subject you to penalties or damages, including but not limited to those related to copyright, patent and trademark infringement. F) The information contained herein is designed to be as comprehensive and factual as possible. American Side Road Cycles reserves the right, however, to make changes at any time, without notice or obligation, to any information contained on this Site. By entering this Site you acknowledge and agree that you will be bound by any such revisions. G) This Site may contain links to other web sites. Links to other web sites do not imply any approval, affiliation, association, endorsement, recommendation or sponsorship of the linked web site by American Side Road Cycles. By entering this Site you acknowledge and agree that American Side Road Cycles is not responsible for the contents, availability, operation or performance of web sites to which this Site may be linked. Your linking to any other web sites is at your own risk. H) By entering this Site you acknowledge and agree to assume the risk that the information and materials on this Site may be inaccurate. Although reasonable efforts are taken to ensure the accuracy and integrity of information and materials provided by American Side Road Cycles on this Site, accuracy cannot be guaranteed and American Side Road Cycles makes no warranties or representations whatsoever as to its accuracy. This Site, and all information and materials contained herein, is provided to you "AS IS" without any kind of warranty, express or implied, including, but not limited to, the warranties of merchantability, fitness for a particular purposte and non-infringement. I) American Side Road Cycles has no control over the usage of any part. American Side Road Cycles expects that their customers will exercise good judgement as to the proper selection, installation, use and maintenance of any parts. American Side Road Cycles assumes no responsibility for damage or injury of any kind because of the misuse or improper application of any parts in any way by any person. Use motorcycles at your own risk.American Side Road Cycles shall not be liable for any indirect or consequential damages whatsoever. All matters shall be interpreted under California law. Replacement will be limited to parts only and does not include labor claims of any type. If the manufacturer has a written warranty, it will be included with the item you purchased. The manufacturer shall be solely responsible for any damage to person or property arising from design and manufacture and testing of its products and we accept no liability for such damages. We shall not be liable for consequential damages. 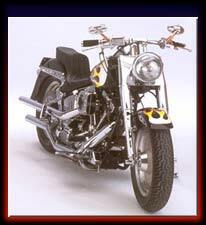 J) The words: Heritage Springer, Dyna Glide, Electra Glide, Evolution, Fat Boy, HD, H-D, Harley, Harley-Davidson, Buckhorn, Road Glide Heritage Softail, Low Rider, Heritage, Road King, Roadster, Softail, Deep Tiller Six Bend, Spaghetti Six Bend, Knucklehead, Dresser, Speedster, Sportster, Sturgis, Super Glide, Tour Glide, Ultra Classic, Wide Glide, Bad Boy, 883, Convertible, California Pullback, California Spread Pullback, Tall Bars, Duo Glide and Hydra Glide registered trademarks of Harley-Davidson, Inc., Milwaukee, Wisconsin, U.S.A.
K) The following model designations for Harley-Davidson&REG; motorcycles are used in this website for reference only: EL, FL, FLH, FLHC, FLHF, FLHR, FLHRI, FLHRCI, FLHS, FLHT, FLHTC, FLHTCI, FLHTCU, FLHTCUI, FLHTC Ultra Classic, FLHX, FLST, FLSTC, FLSTF, FLSTN, FLSTS, FLT, FLTC, FLTC Ultra Classic, FLTCUI, FLTR, FLTRI, FLTHCULTRA, FX, FXB, FXD, FXDB, FXDC, FXDG, FXDL, FXDS, FXDS-Conv., FXDWG, FXDX, FXE, FXEF, FXLR, FXR, FXRC, FXRD, FXRDG, FXRP, FXRS, FXRSE, FXRS-Conv., FXRS-FXRT, FXRS-SP, FXRT, FXS, FXSB, FXST, FXSTB, FXSTC, FXSTS, FXSTSB, FXWG, GE, K, KH, WL, WLA, XL, XL 883C, XL 1200C, XL1200S, XLCH, XLCR, XLH, XLH883, XLH1100, XLH1200, XLR, XLS, XLT, XLX, XR, XR1000 and are not intended to imply that any of these parts are made by or with permission of, or endorsed by, Harley-Davidson&REG; Inc.
L) The words, names or trademarks or registered trademarks of BMW, Can Am, ATK, Kawasaki, Honda, Husqvarna, Yamaha, Triumph, Polaris, Vespa, Suzuki and all others used in this website are for reference only and are the property of their respective holders and are not intended to imply that any of these parts are made by or with their permission or endorsement. M) Please review our Terms of Business page. N) American Side Road Cycles is a Division of Omnia Vincit Amor Incorporated.